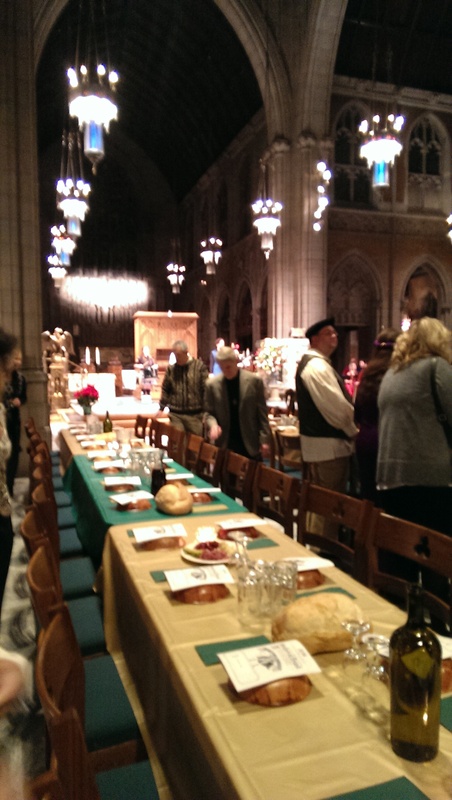 One of the most unique dining events in Cleveland is the Medieval Feast at Trinity Cathedral. It used to span two nights, but has now been limited to just one night in January. Tickets sell out fast, so I quickly booked a ticket. The ticket price of $70 benefits Trinity’s Music and Arts program. Many attendees were in period (and not-so-period) attire, but it wasn’t a must. It was definitely a fun night, and I’m glad I braved the bad weather this year (this year it was held on Friday, January 25th). The Feast was held during a huge snowstorm and I had initially turned back home, but my friend called assuring me the roads were not as bad as I thought. It was slow going, but not impossible. There were numerous empty seats, however, because some people decided not to brave the weather. Doors opened at 7 PM, and the Cathedral opened for dinner at 8 PM. The foyer hosted mulled cider and hot apple cider as well as a table of cheese and crackers. By the time I arrived the cheese and crackers were pretty much decimated. Service of the courses was slow (it’s hard to feed 300 people at once), so we didn’t leave until almost 11. I can’t imagine how late they were there breaking down the tables and preparing for the Sunday service the next morning. We walked into the Cathedral in a procession of bagpipes. I love the Cathedral, so I can’t imagine a more lovely venue to have a meal. We quickly found our seats at our assigned table and tucked into the pickled beets, cauliflower, onions and cucumbers as well as loaves of bread from Breadsmith. Dinner was unfortunately not served on trenchers of bread, but rather in salad bowls. We ate with our hands. Luckily I was aware of this ahead of time and brought the hand sanitizer. Some previous attendees brought their own silverware, but if you ask me that is cheating and detracts from the experience (those same people also brought plastic bags for leftovers, so…). The tables were set with pitchers of water and large bottles of burgundy and chablis wine, and the servers came around with two choices of beer – Stella Artois Belgian lager or Honey Brown Ale. They kept refilling when asked. I went with the Stella. It was refreshing and paired quite nicely with the first two courses (I switched to water after that since the roads were treacherous). The first course was chicken breasts stuffed with Stilton cheese and honey glazed carrots. 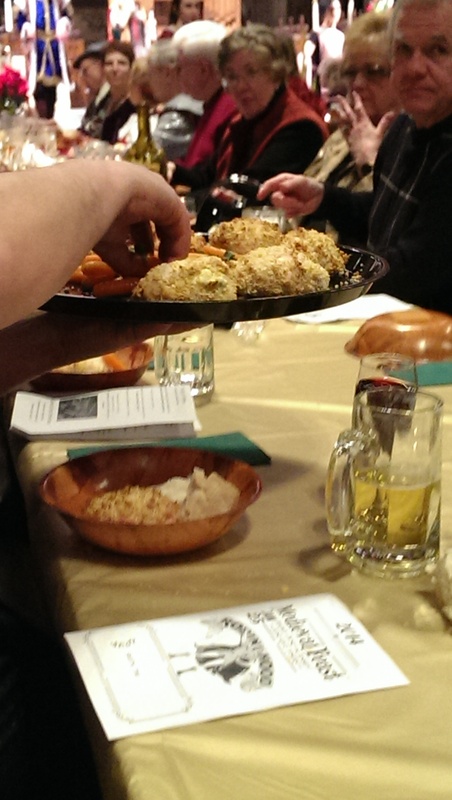 We sat with the guy who had stuffed the chicken breasts, so it was fun hearing some behind-the-scenes-prep stories. The chicken was amazing. They were lightly breaded, and the Stilton was an excellent pairing. The honey glazed carrots were also delicious. I hadn’t yet found my groove for photographing the food, and had trouble photographing this course. 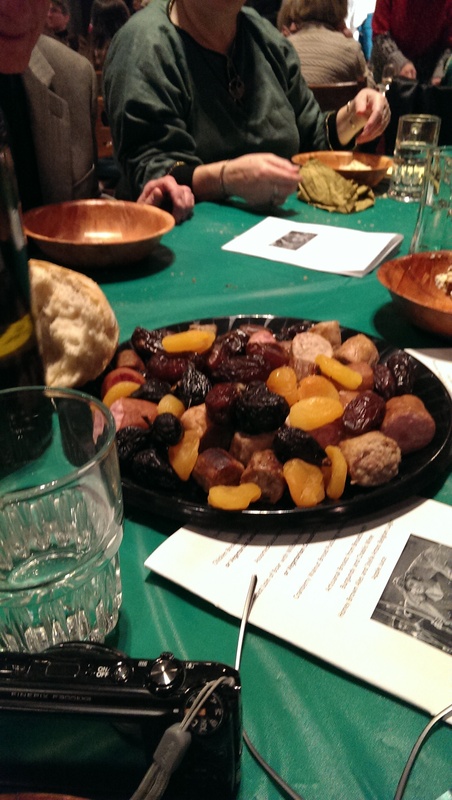 The second course was a plate of assorted sausages and dried fruit. 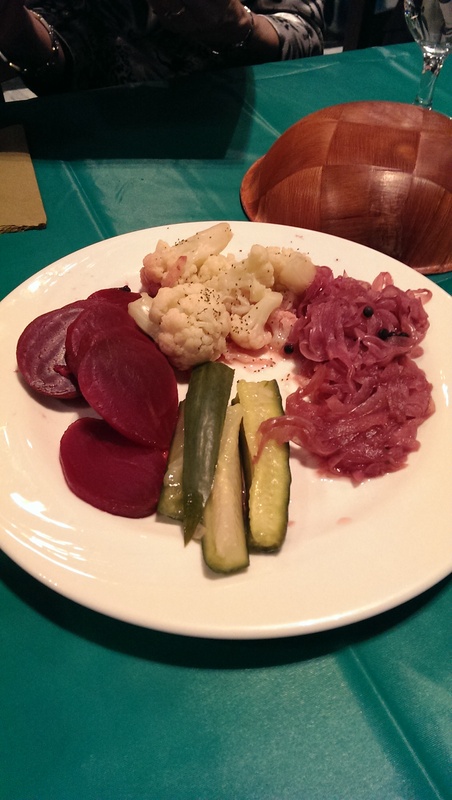 There were four different sausages, ranging from a kielbasi to what might have been a blood sausage. They were very moist and delicious. The dried fruits were dates, figs and apricots. 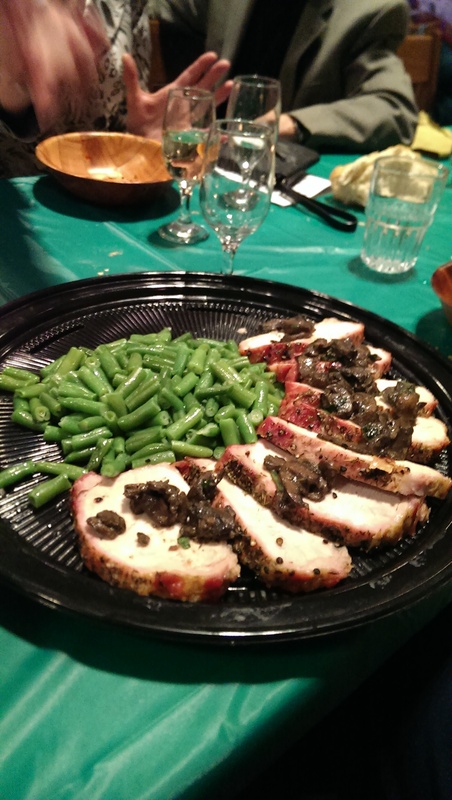 Our third course was billed as roast loin of boar with wild mushroom sauce and green beans, but I honestly think it was pork. The wild mushroom sauce was DIVINE! The pork was perfectly seasoned and cooked and was not at all dry. 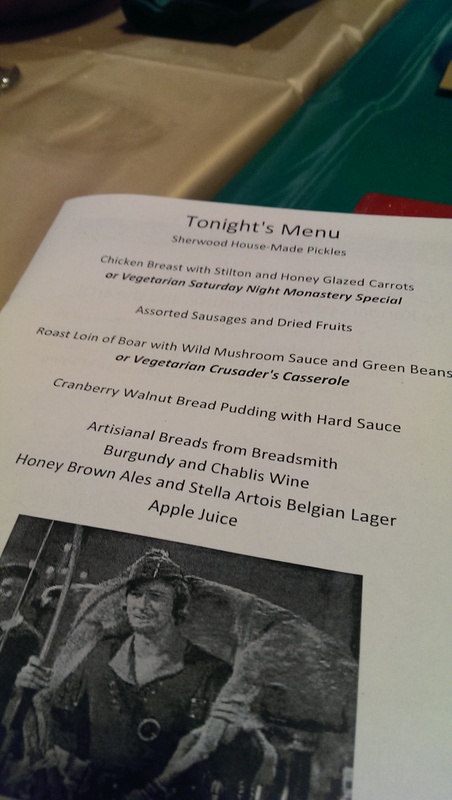 The dessert course was amazing – and had been touted as being their best dessert they have ever had at the Feast. 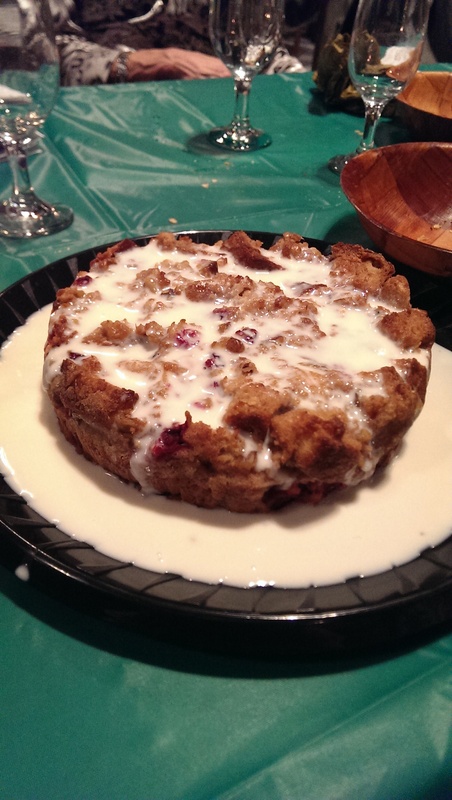 It was a cranberry walnut bread pudding with a hard vanilla sauce. I was stuffed at this point, but the dessert was so good I had several (small) handfuls. They offered entertainment to keep us occupied during the breaks between courses. In addition to fencers and jugglers, they had actors portraying the Sheriff of Nottingham, Robin Hood, Friar Tuck and Maid Marion, which carried on throughout the evening. They had tucked away playtime coins under the bowls that we were to give to Robin Hood or his henchmen when they came by. They had a group of madrigal singers, which were quite talented. Todd Wilson played the organ for a sing-a-long. 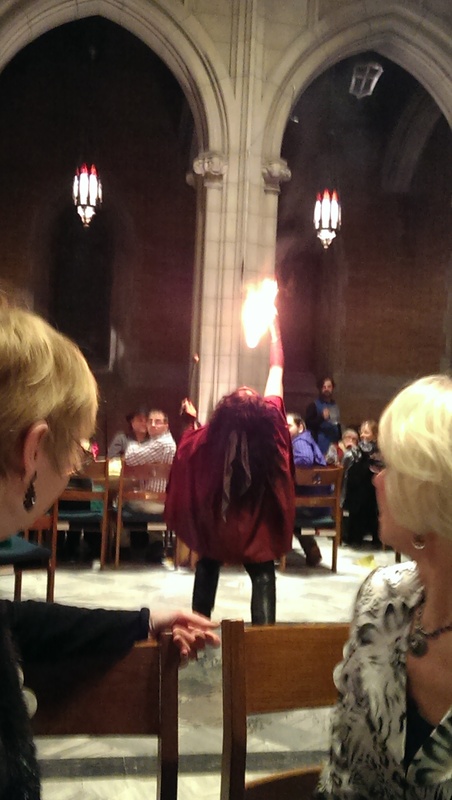 And last but not least they had a fire breather for entertainment as well. It was definitely an experience that should not be missed – and the money goes to a good cause! The funds raised from the Feast allow Music and Art to produce its free Brownbag Concert series, which are every Wednesday at noon and is a great lunch break. Tickets for the Feast go on sale in mid-December here.